Thank you so very much! Your reply made my day. ☺ I truly appreciate you taking the time to advise ( and I can see you are a truly a teacher at heart, sense of humour included!). Know this has been a very busy period for most, myself as well. Qn 4: "Therefore, if you are getting a Berkey filter, do check whether they are using the new filter elements or the original Doulton/BB filter elements." Meaning to say, between the original Doulton/BB (British Berkefeld) filter elements and the new Berkey (Black Berkey) elements, which is superior in terms of filtration? I note the inverted commas you used when you talked about NMC "improving" the original filters... 😉 so I want to know if the Black Berkey might really be a level up! The Pure Effects website pointed out that for gravity-fed filters, a main disadvantage is that " the water sits in contact with the holding chamber (plastic or metal) and has ample opportunity to absorb metal/plastic ions before going into your cup. Bacteria & fouling are also a concern with standing water in such systems (especially in warmer weather), as well as constant exposure to air/touch." What are your views on these points raised? The potential bacterial growth does sound like something to be concerned about, and I am not sure what can be done to combat it properly and sufficiently. I would be most grateful if you could help clarify further on these. Thank you very much and I hope you have a wonderful weekend too. Thank you for your kind words. Here are my thoughts to your queries. I am assuming that you really do need (or want) a water filter and whatever capabilities they have to offer. Let's further narrow down to only 2 choices - Doulton vs. Berkey filter elements in a gravity fed setup. Here is an interesting read on Berkey's website comparing the 2 filter elements. Naturally, it concluded that Berkey is superior to Doulton. I will leave cost out of the picture because the prices of the 2 seem close and depending on who you purchase from and what promotions they are offering at the time, 1 or the other can come out cheaper. "While the Doulton is capable of removing 99.99% bacteria and cysts, it is not capable of removing viruses to the required 99.9999% that qualifies the Berkey as a water purifier. The Big Berkey is capable of 99.9999% removal of bacteria, 99.9999% removal of cysts, and 99.9999% removal of viruses"
The same capabilities of Doulton were given in Arkwater's webpage. However, on the Water for Life webpage, it mentions 99.9999% (i.e. 6 log reduction) removal of bacteria but only 99.99% (i.e. 4 log reduction) removal of viruses. No mention was made of removing cysts. Berkey's webpage claims that their standard filter elements can remove heavy metals and Doulton ones will need a post filter. However, if you get a Doulton ATC SuperSterasyl, you can too remove heavy metals without a post filter. "The Big Berkey produces a maximum of 84 gallons per day with the standard 2 element system compared to a maximum of 12-15 gallons a day produced by the standard Doulton system." My biggest issue lies with this claim. Basically, they are saying that the Berkey can filter 5-6 times faster than a Doulton. Both filter elements are about the same size and made up of various media compacted into a very tight matrix with tiny pores allowing water to pass through. If you want to remove more contaminants e.g. microbes, you need the pores to be smaller and/or more surface area for the water to pass through. This translates to a longer travelling time for your water within the filter element. Yet, for some reason (perhaps some undisclosed scientific innovation/ breakthrough), you can still get an output of 5-6 times over a similar competitor. But I assume such a scientific innovation/ breakthrough (if indeed it is one) will not be cheap. Without sounding cliche, remember a customer always wants a product/service to be cheap, good and fast. He can only get good and fast but not cheap or any other combination of 2 desirables but never all 3. IF you are concerned about viruses in your water, yes, do get the Berkey, though I imagine the Doulton should be able to remove viruses to a certain extent. Otherwise, I believe it ultimately comes down to cost. Although the Berkey webpage lists several advantages in terms of warranty, I am not sure whether they apply to international customers. Good luck choosing! Seriously, short of processing your water through force fields without contacting any material, all filters/purifiers have issues of potential chemical leaching and fouling. In a gravity filter, it is more obvious because the filtered water is stored in a container, waiting to be used. In the case of Pure Effect Filters (countertop, under-counter or whatever), does the water not have to pass through filter housings (usually plastic but can be stainless steel in other brands/models) holding the filter elements? When you close the faucet, whatever water remaining in the setup will still have to sit inside these housings. Depending on the materials of construction and the environment, these housings too have the potential to leach chemicals into your water or become covered by a slime layer of bacteria/algae on the inside over time. Figure: I count 3 housings in this countertop filter from Pure Effect Filters and they are apparently made of plastic. The trick is to have a knowledge of how safe various materials are. Plastics have been having a bad reputation the past years because of the high profile and nasty chemical, BPA found in certain plastics. BPA basically helps to hardens a plastic but evidently, it can leach into water it comes into contact with, especially at elevated temperatures. It has been linked to a range of human health problems, including a higher risk of certain cancers, reduced fertility, birth defects and diabetes. To make matters worse, the so called BPA-free plastics are not guilt free either. Studies have shown that the BPA substitute, BPS can display similar or worse effects compared to BPA. As underlined earlier, not all plastics are created equal. Some are clearly more hazardous than others. HDPE, LDPE and PP have been cited to be the safest plastics. Not sure which plastic is which? 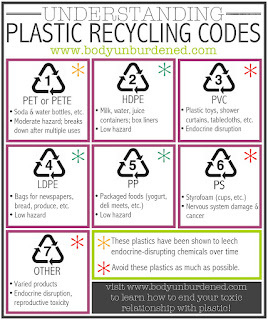 Check out the recycling codes (a number within a triangle) usually on the underside of a container. 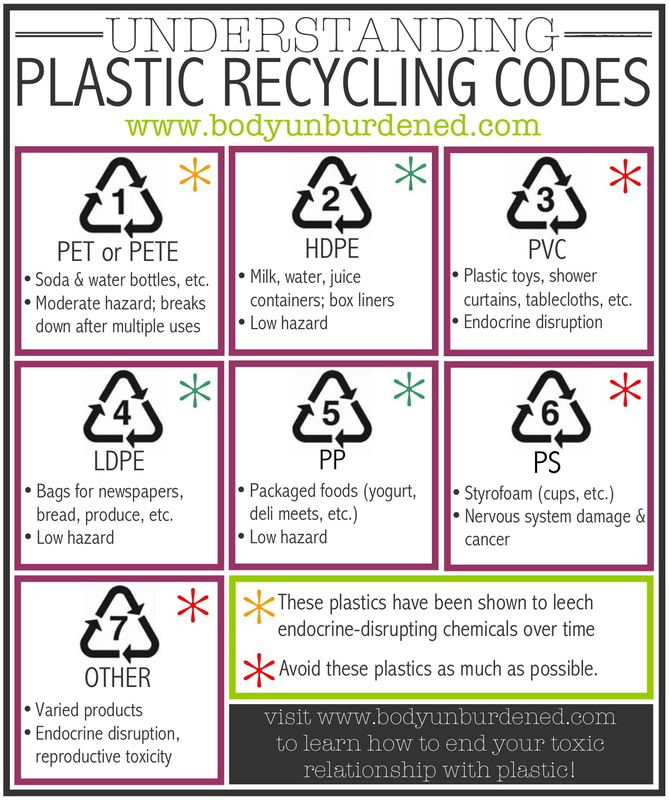 Codes 2, 4 and 5 indicate HDPE, LDPE and PP, respectively. No doubt, glass and ceramic are generally very safe but due to their breakability, they are not my favourites. Whatever material you use, maintenance is still needed. You can't be lazy and leave the container as it is. Open it up to check. If you find deposits and slime growing, for goodness sake, please clean it with soap and water at least. SS is clearly superior as it has less chance of getting scratched and small pieces dislodged during cleaning. And it is resistant to most cleaning chemicals (NOT bleach though). However, SS can be corroded in a salty environment. Drinkers of salty soup and sauces beware... and not just from the sodium you are ingesting. You may be ingesting chromium and other elements which are part of SS.